Sixteen participants joined the three-day course. The participants found the course materials well designed, but they suggested more time to allocate for lectures and practical sessions. They were given a certificate on the conclusion of the course. Dhaka – Senior civil servants have asked their to be successors to acquire more knowledge on environmental governance to help save the planet through its better application in this part of the world. The public servants have no limit in learning something as they need to do many things at various tires, said Md. Mozammel Haque Khan, Senior Secretary to the Public Administration Ministry, referring to the environmental issues and the 1992 landmark Rio Conventions signed in Brazil. “If you are posted as a deputy commissioner in the district, the issue will be yours. There will be other experts in the relevant fields, but as a deputy commissioner you have to deal with the issues,” he told a group of officers attended a training session in Dhaka. 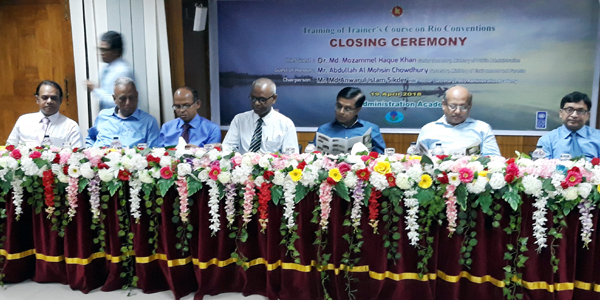 A three-day Training of Trainers on Rio Conventions began on Tuesday at Bangladesh Civil Service Administration Academy was jointly organized by the Rio Conventions project of UNDP and the Department of Environment, Ministry of Environment and Forests. Khan addressed the concluding session Thursday as chief guest. He requested the participants to find more materials to enrich them as the climate change and Rio Conventions are very big issues. It is not only important for Bangladesh, but also for the world, he added. The senior secretary assured the organisers that his ministry would put much effort to properly select the trainers. Presided over by Anwarul Islam Sikder, Rector of the BCS Admin Academy, the session was also addressed by Environment and Forest Secretary Abdullah Al Mohsin Chowdhury, Director General of the Department of Environment, Director of the Department of Environment and National Project Director of Rio Convention Project Ziaul Haque. Abdullah Al Mohsin Chowdhury described the necessity of the training course of Rio Conventions on the climate change, bio-diversity and desertification. Ziaul Haque talked about the back ground of the Rio Project. “Climate change, environmental pollution and land degradation are now reality. Everybody accepts it and there is clear evidence,” Haque said adding that the human are responsible for the degradations. “Because of our activity we are not sure whether we can shorten the anthropogenic era. We should behave responsibly to alter the changes and improve the ecosystem, environment,” he added.